This appendix describes the fire behavior on the Cramer Fire from July 19 through July 22, 2003, and includes a discussion of conditions and events contributing to the fire behavior. Several key geographic features in the fire’s vicinity are not indicated on commonly available maps and were denoted for this report to minimize confusion about locations being discussed. 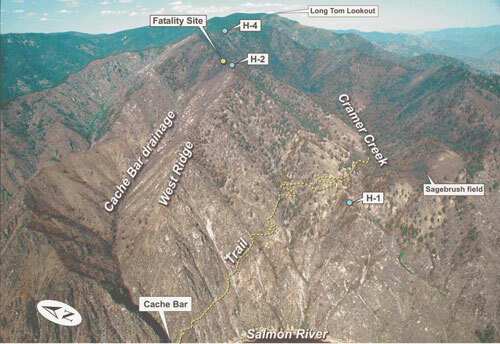 Specifically, these are the two helispots (H-1 and H-2), the West Ridge (the east-west ridgeline on which H-2 is situated), and the Cache Bar drainage (a small drainage running north and east from Cache Bar, a raft takeout location on the Salmon River). These locations are indicated on figure 1. Central Idaho, including the region encompassing the Salmon-Challis National Forest (hereafter referred to as “the forest”), had been in a period of prolonged drought for the previous four years. 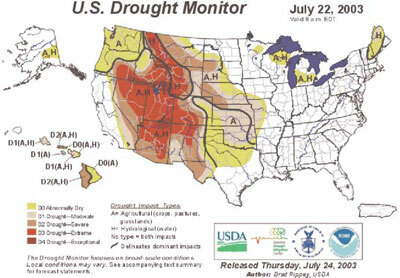 The National Drought Monitor for the week of July 22, 2003 indicated the area was in the “extreme drought” category (figure 2). Precipitation amounts during the winter of 2002–2003 were greater than the previous year. By May, snowpack in central Idaho was near average, ranging from 90 to 110 percent of normal (figure 3). Spring and summer rainfall for the area lagged, however, and was 50 to 70 percent of normal. No significant precipitation had fallen in the area since June 25, 2003. 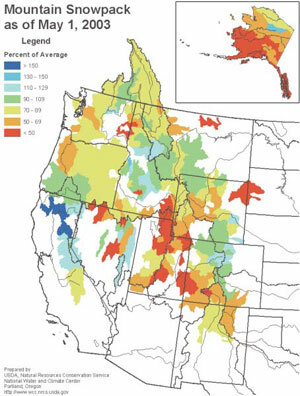 Figure 2—Drought severity map for July 22, 2003. Figure 3—Snowpack as of May 2003. The “cumulative water year,” which accounts for both rain and snow received since October 1, 2002, also showed the area to be in deficit. 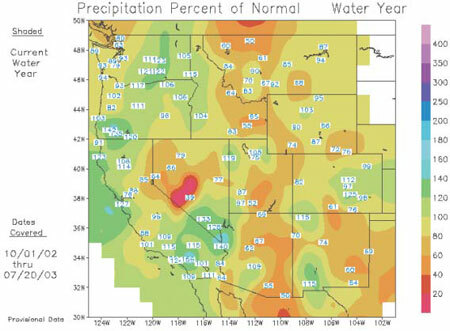 For the 2003 water year (beginning October 1, 2002), the area had received 50 to 70 percent of normal precipitation as of July 19, 2003 (figure 4). This is in sharp contrast to the 110 to 130 percent of normal precipitation received by the same date in 2002. Figure 4—Water year, percent of normal, as of July 20, 2003. Figure 5 is a map of fire-behavior fuel models. Fuels in the Cramer Creek drainage area are primarily grass, grass-litter understory in open stands of ponderosa pine and Douglas-fir, and mixed conifer stands with more continuous canopy in the upper reaches of Cramer Creek. In the Cache Bar and Fountain Creek drainages, south-facing slopes are covered by continuous short grass with scattered shrubs in some places. North-facing slopes are covered by large, continuous brush fields where an intense stand replacement fire in 1985 removed mixed-conifer stands and facilitated brush growth. 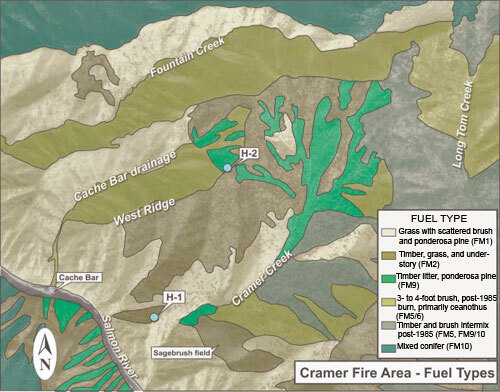 Figure 5—Fuel types in the Cramer Fire area. These brush fields consist primarily of shiny-leaf ceanothus, with pockets of ninebark interspersed. 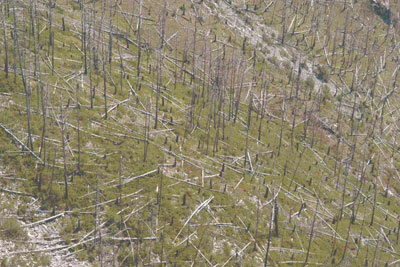 Snags are numerous in these brush fields, and many had fallen, contributing a significant down woody fuel component (figure 6). Where the Cramer Fire burned through the Cache Bar drainage, an examination of stem diameter at ground level of burned ceanothus brush, and comparison to green, unburned brush in Fountain Creek, indicated the average prefire ceanothus brush height to be 3 to 4 feet (figure 7). 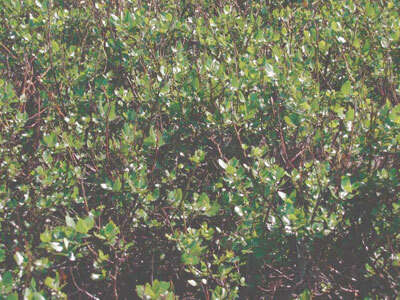 Figure 6—Ceanothus brush field in the Fountain Creek drainage, representative of prefire conditions in the Cache Bar drainage. Figure 7—Ceanothus brush about 3 feet high. 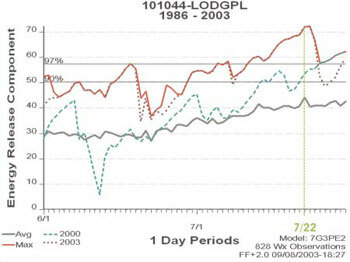 Neither fuel model 5 or 6 alone represents the fire behavior in ceanothus on the Cramer Fire. Fuel model 5 represents the observed spread rates well from 1500 to 1520, but underestimates the flame length. Due to the presence of volatile oils in the green foliage, ceanothus brush can burn intensely as live fuel moisture drops during the summer months, and extreme fire behavior is possible when the live fuel moisture falls below 100 percent. Fuel model 6 more accurately reflects the flame lengths observed under the weather conditions present on July 22. For the latter portion of the run through brush, from 1520 to 1525, fuel model 4 more accurately predicts the spread rates observed. However, the observed flame lengths were intermediate between what fuel models 4 and 6 predict. 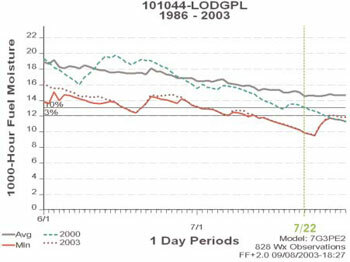 In June and July 2003, forest personnel periodically measured live and dead fuel moisture levels. Sampling was not done to meet statistical standards, but was intended to provide a general estimate of live fuel moisture levels. Live fuel moisture sampling was limited primarily to conifer species, though on July 30, they also included several prevalent brush species in the sampling to gauge the conditions present the first few days of the Cramer Fire. They noted that as of the end of July, live fuel moisture levels on the Forest were at or below levels recorded during the same time in 2000, considered to be a “benchmark fire year” on the forest. Table 1 shows fuel moisture levels measured on July 15 and July 30, 2003, at various sites around the Cramer Fire. * Thought to be high, possibly a bad sample. Hot, dry conditions prevailed from the end of June through July. Daytime temperatures in the vicinity of the Cramer Fire peaked at over 100 °F at lower elevations, and into the mid 80s at Long Tom Lookout. Relative humidity (RH) from 10 to 15 percent was common at midslope locations, and night time RH recovery seldom exceeded 60 to 65 percent. Night time inversions in the Salmon River drainage commonly produce a thermal belt effect at midslope elevations, promoting active burning conditions at night. Thermal belts were present on July 20 and 21, and resulted in active burning on the Cramer fire well into the late evening and early morning on these nights. Remote Automated Weather Stations (RAWS) are located on seven sites on the forest and are routinely used to track weather and fire danger trends (figure 8). The Skull Gulch RAWS was in the location most representative of the Cramer Fire, but was found to have a bad temperature/ humidity sensor during the initial stages of the Cramer Fire. It was also found to have a programming error that resulted in improper reporting of wind speeds. As a result, all data for the Skull Gulch RAWS was considered to be inaccurate and unusable. Of the remaining stations, Indianola (elevation 3400 feet) best represented weather conditions at the lower elevations of the Cramer Fire (H-1 and lower Cramer Creek), and Lodgepole (elevation 6100 feet) represented midelevation conditions reasonably well (H-2 and upper Cramer Creek). 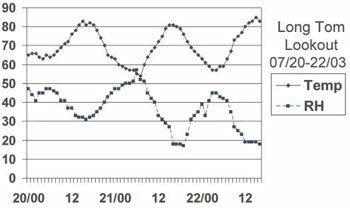 Figure 8—Temperature and relative humidity trends produced by the Indianola and Lodgepole RAWS 10 days before the fire. 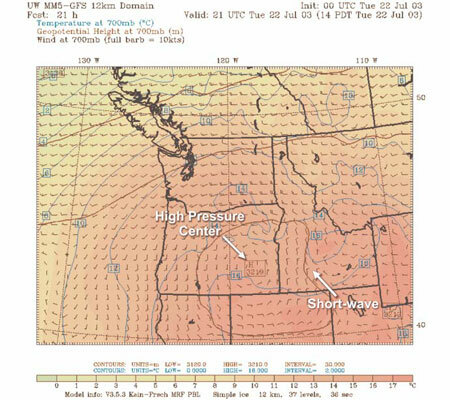 A large ridge of high pressure dominated central Idaho in mid to late July with a thermal trough of low pressure at the surface. Prior to July 22, 2003, the surface wind pattern was diurnal in nature with thermally induced slope and valley wind components. Forecast models for the day of July 22, 2003 indicated that a weak “short wave,” or weather disturbance, could move through the area. This would change the typical diurnal wind pattern to a more synoptic or large-scale pressure pattern with northwest- to-west winds over central Idaho. This would especially be evident in westto- east or northwest-to-southeast-oriented valleys and drainages. This change in wind patterns was reflected in the fire weather forecast for zone 405 issued the morning of the 22nd, which forecast northwest winds 5 to 15 mph (figure 9). Figure 9—Shortwave disturbance and associated winds forecast for July 22, 2003. Wind observations taken from the RAWS sites at Lodgepole and Indianola indicated the 20-foot, 10-minute average winds had turned west to northwest late in the afternoon. Afternoon and early evening 20-foot, 10-minute average windspeeds ranged from 2 to 11 mph at the Indianola RAWS site and from 6 to 14 mph at the Lodgepole RAWS site. This would result in one-minute-maximum peak eye-level windspeeds from 15 to 19 mph with possible gusts of 23 to 28 mph. The afternoon upper-air sounding (figures 10a and 10b) taken at 0800 and 1800 MDT at Great Falls, MT, also indicated that surface wind directions had changed that afternoon to westerly in the lower levels, indicating a weak trough passage. Windspeeds were 5 to 15 knots (6 to 17 mph) below 12,000 feet mean sea level. 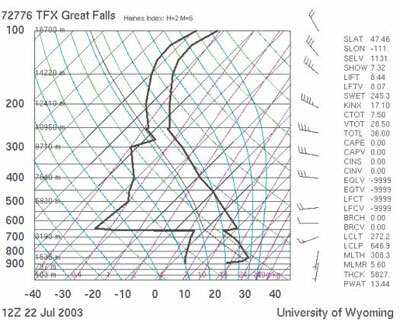 Figure 10a—Upper-air soundings (skew-t) from Great Falls, MT, at 0800 MDT. 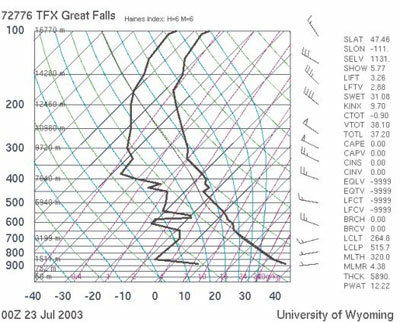 Figure 10b—Upper-air soundings (skew-t) from Great Falls, MT, at 1800 MDT, indicating a trough passage. Temperatures for the previous 90-day period indicated surface temperatures in the area of the fire to be 3 to 6 °F warmer than normal. The week previous to the start of the Cramer Fire, Long Tom Lookout recorded an afternoon high temperature of 87 °F on Saturday, July 19th. Afternoon high temperatures for the period of July 20–22, 2003, at the Lodgepole and Indianola RAWS sites were in the mid-90s to low 100s with overnight lows in the mid-40s to low 50s at Lodgepole and in the lower 50s at Indianola. 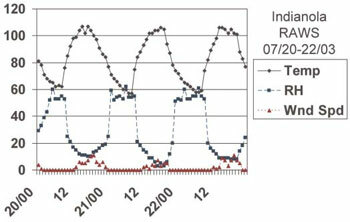 The RAWS relative humidity (RH) data for July 20 through 22 indicated night time humidity recovery of 60 to 70 percent, although humidity values remained less than 60 percent until around sunrise on the mornings of the 20th through the 22nd. This, combined with the warm overnight temperatures in the thermal belt, contributed to a longer night-time period of active burning. The minimum afternoon RH at Indianola and Lodgepole on the 20th were 10 to 15 percent respectively, dropping to 3 and 4 percent on the 21st, and at 8 percent at both sites on the 22nd. Figures 11a, 11b, and 11c show detailed temperature and RH data. Figure 11a—Temperature and relative humidity data from the Indianola RAWS site for the first 3 days of the Cramer Fire. 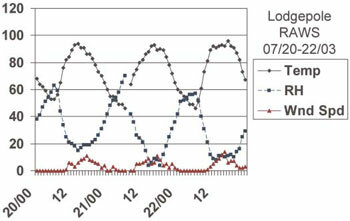 Figure 11b—Temperature and relative humidity data from the Lodgepole RAWS site for the first 3 days of the Cramer Fire. Figure 11c—Temperature and relative humidity data from the Long Tom Lookout RAWS site for the first 3 days of the Cramer Fire. The forest uses the Energy Release Component (ERC) of the National Fire Danger Rating System (NFDRS) for initial fire sizeup, complexity analysis, and management response. It also uses the Burning Index (BI) as a standard index for predicting general fire behavior on the forest. The ERC relates to the potential available energy per unit area in the flaming front of a fire, while the BI reflects the potential fire intensity and difficulty of control. The BI is somewhat sensitive to changes in weather conditions, and the ERC much less so. 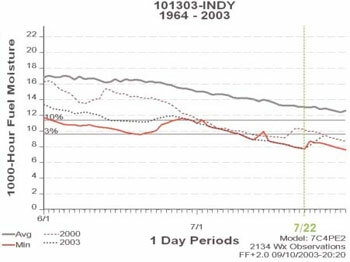 In July 2003, the overall BI level on the forest was well above the 90th percentile, and the ERC was in the 96th percentile, indicating extreme burning conditions. Both the Indianola RAWS (NFDRS fuel model C, open pine stands with grass understory) and Lodgepole RAWS (NFDRS fuel model G, dense conifer stands) indexes also indicated extreme burning conditions. ERC values for both stations were well above the 97th percentile, and for the previous three weeks, the Lodgepole ERC had been at or near the historical extreme. The Indianola station showed the BI to be at the 95th percentile, and for Lodgepole, the BI was well above the 97th percentile. Calculated 1,000-hour fuel moistures were 8 and 9 percent respectively, and for the previous month, had been at or near the historic extremes. 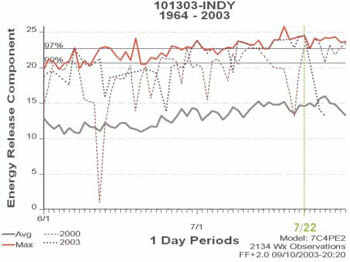 Figures 12a, 12b, and 12c show graphs of NFDRS indexes from the Indianola and Lodgepole RAWS. 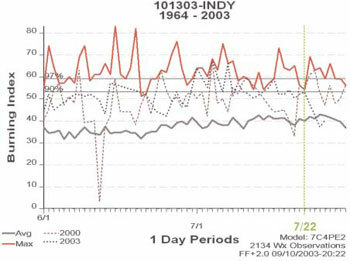 Figure 12a—Fuel moisture graphs from the Indianola and Lodgepole RAWS sites (2000 is included for comparison). Figure 12b—BI graphs from the Indianola and Lodgepole RAWS sites (2000 is included for comparison). 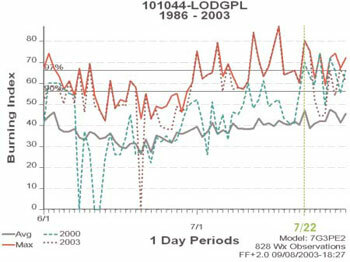 Figure 12c—ERC graphs from the Indianola and Lodgepole RAWS sites (2000 is included for comparison). The Salmon River Breaks along the Salmon River are characterized as steep, dry, and rugged, with limited visibility because there are steep areas with very pronounced relief. 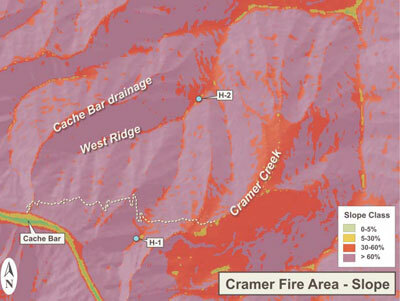 Slope in much of the Cramer Fire area exceeds 60 percent, with more moderate slopes limited largely to the bottom of the Cramer Creek drainage (figure 13). These steep areas are predisposed to rapid uphill fire spread, problems with rolling firebrands, and extreme fire behavior under dry conditions. The topography also has a strong influence on surface winds, and thermally-induced diurnal slope and canyon winds are the norm. Additionally, night time inversions in the deep river canyon of the Salmon River often create a thermal belt effect at midslope, causing fires to remain active into the night and early morning (figure 14). Figure 13—Slope classes (percent) in the Cramer Fire area. 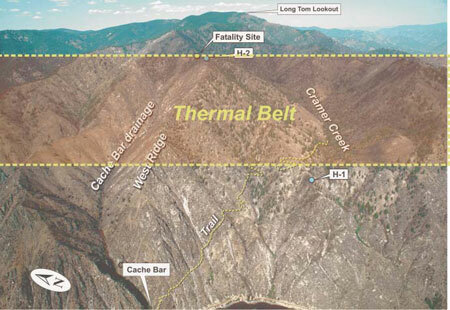 Figure 14—Schematic diagram of the general thermal-belt location in the Cramer Fire area.